Who’s ready for a holiday party? 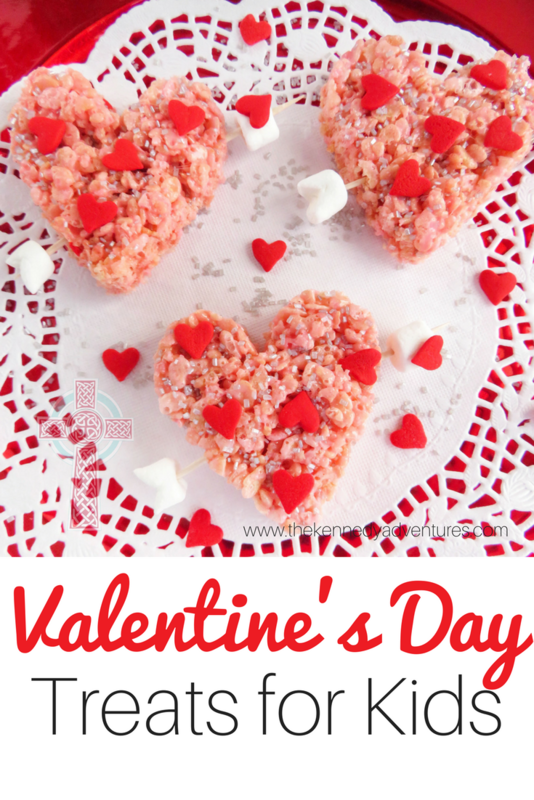 Did you sign up for bringing Valentine’s Day treats to the classroom or co-op this year? 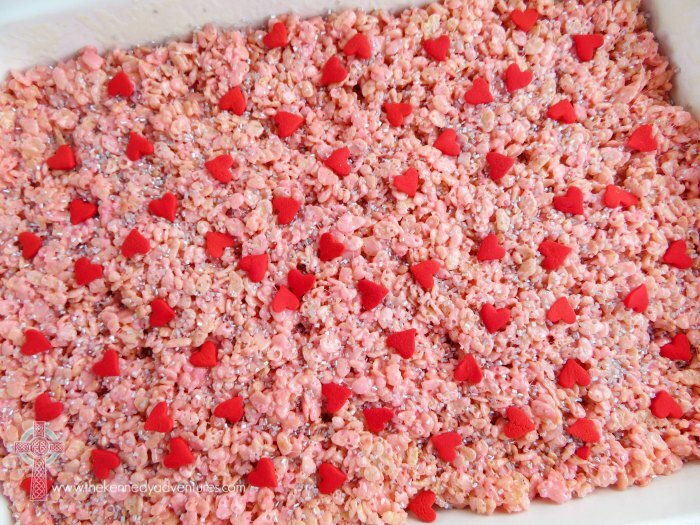 Whether you’re volunteering or just want to make a fun surprise for your children, these easy Valentine’s Day treats (made from Rice Krispies) are sure to earn you some cool points. In our house, we make Valentine’s Day a family event. With 6 children, romantic adult time is at a premium. We shift gears a bit, and make this day fun for everyone. We read our favorite books, watch movies and make special desserts. 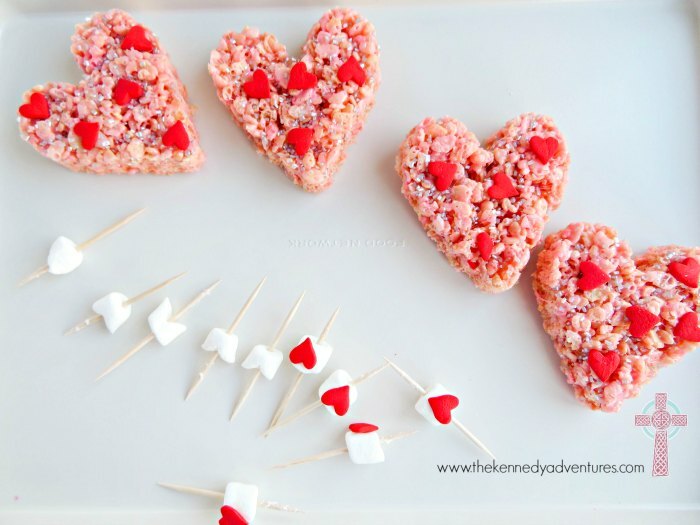 My kids ADORE Rice Krispie treats all year long, but this Valentine’s Day twist is one of their favorites. Check your pantry for supplies,and let’s get started. Grab a saucepan and melt your butter over medium heat. 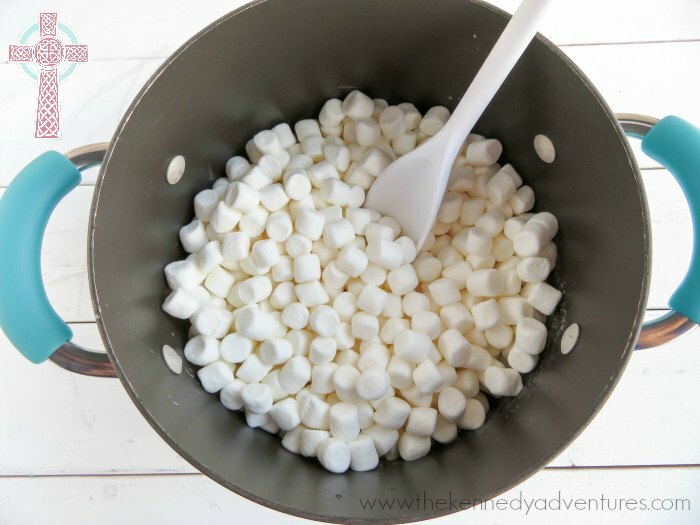 Then, add your marshmallows and mix until melted. 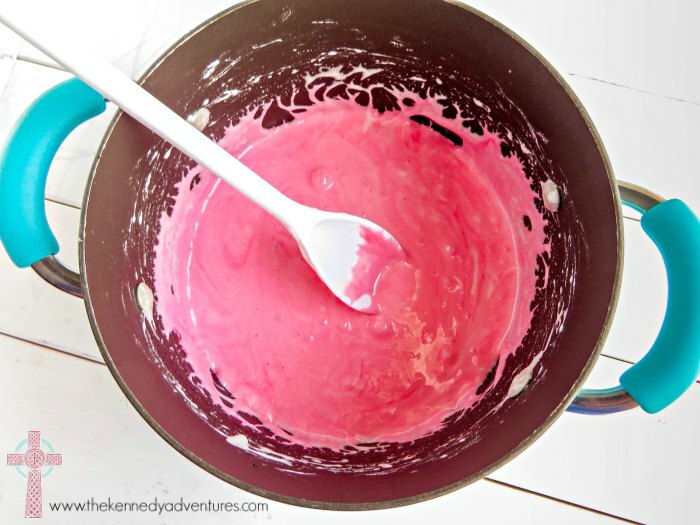 Remove the butter and melted marshmallows from the stove and add in food coloring. 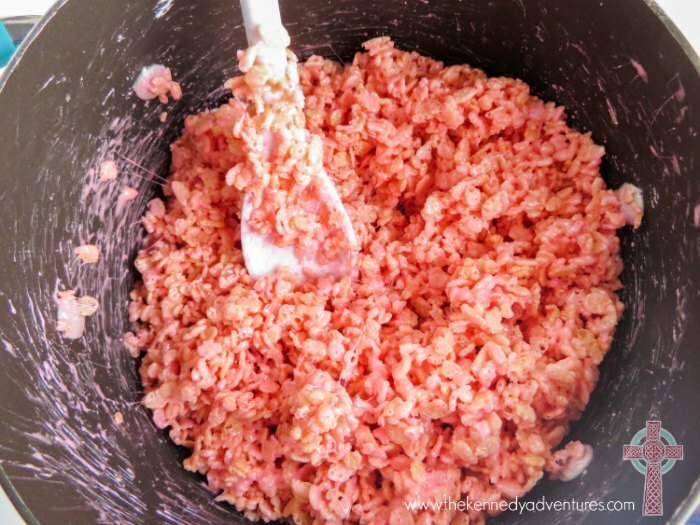 Stir in the Rice Krispies and coat the cereal with the butter/marshmallow mix. 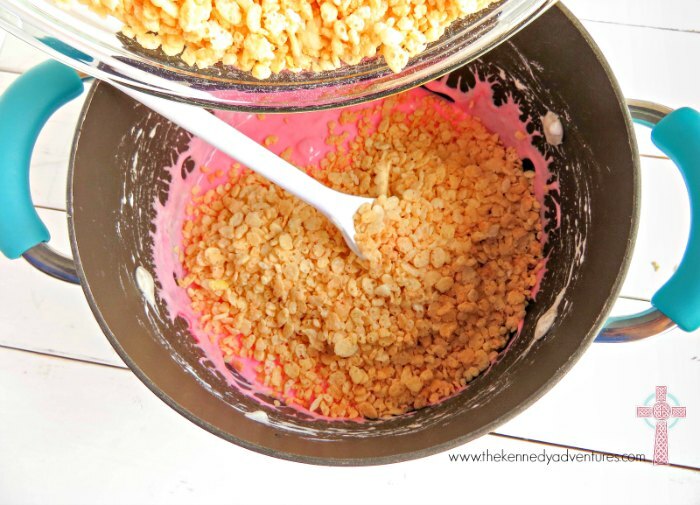 Press this mixture into a buttered 9×13 pan – make sure to get it into the corners! Mom tip — it’s a little easier to press this sticky mixture into the pan if you grease your hands a little with butter. My little helpers LOVE this step. 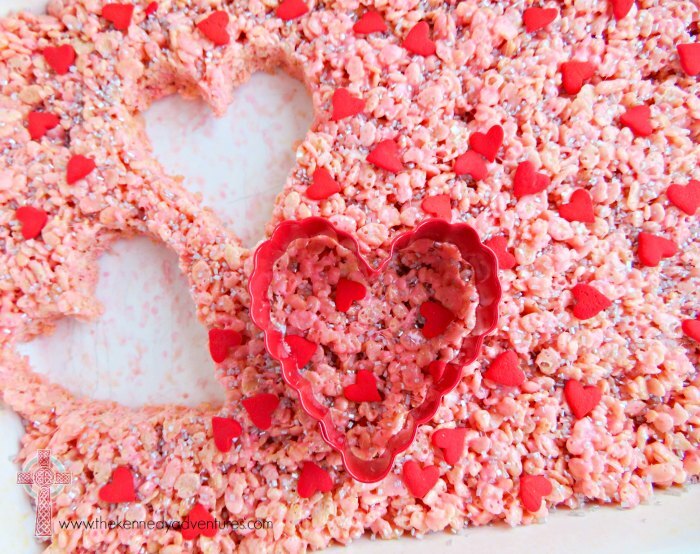 Sprinkle the pan with silver crystals and confetti hearts. My kids call this ‘adding extra fun’! Let this cool and set up for about 15 minutes. Now, you’ve got time to make your arrows. Then, grab another marshmallow and a confetti heart. 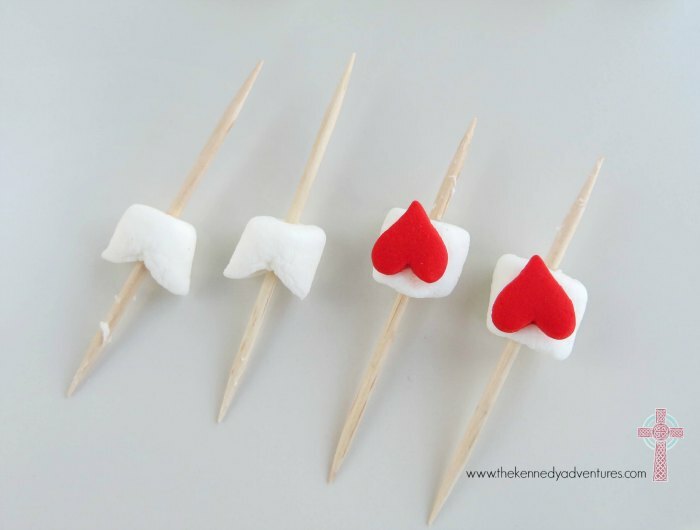 Using the edible adhesive, stick the confetti heart on top of the marshmallow. Stick this heart on another toothpick. Repeat until you have enough arrows for the hearts you’ll be making. By this point, your treats should be cooled enough. Grab your cookie cutter, grease it with a little butter and begin to cut out hearts. Remember the arrow parts we made? The triangle pieces are your tail, and the hearts are the point of your arrow. Insert the toothpicks on each side at an angle. 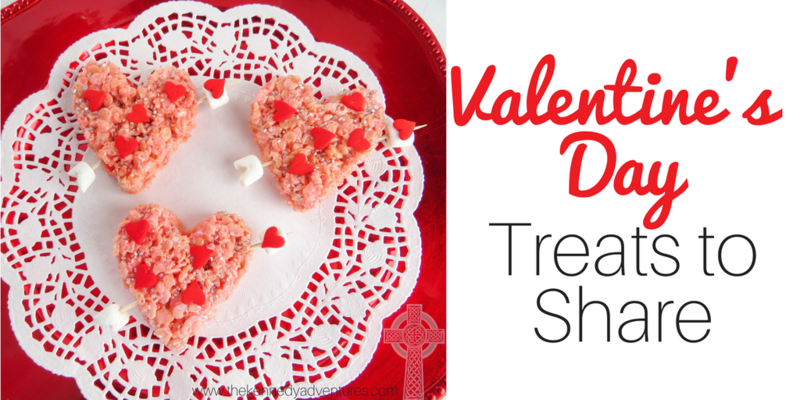 Serve up these beautiful treats with plenty of love! I’d love to hear from you — how do you plan to make your Valentine’s Day special? Be sure and share your ideas in the comments! 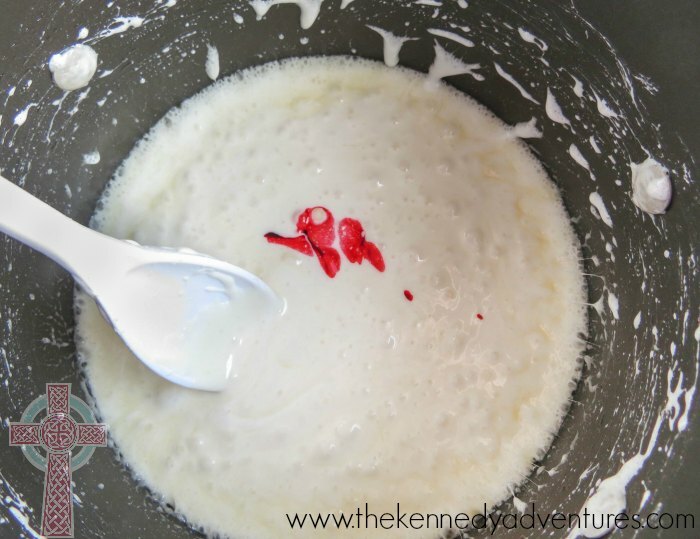 Press this mixture into a buttered 9x13 pan - make sure to get it into the corners! Mom tip -- it's a little easier to press this sticky mixture into the pan if you grease your hands a little with butter. My little helpers LOVE this step. 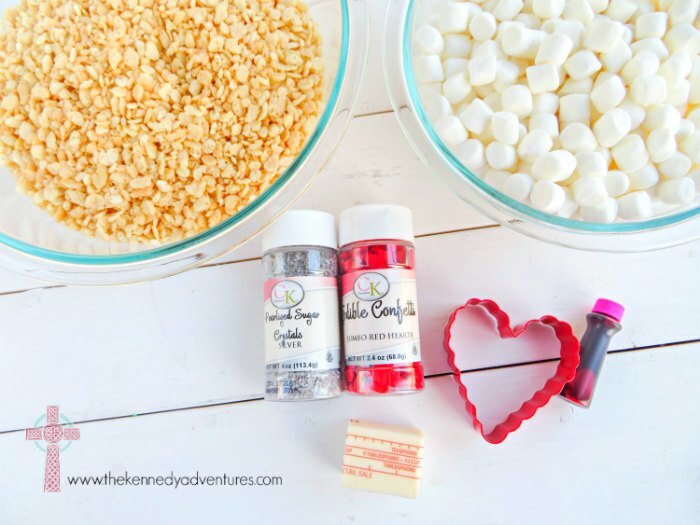 Sprinkle the pan with silver crystals and confetti hearts. My kids call this 'adding extra fun'! Now, you've got time to make your arrows. Then, grab another marshmallow and a confetti heart. 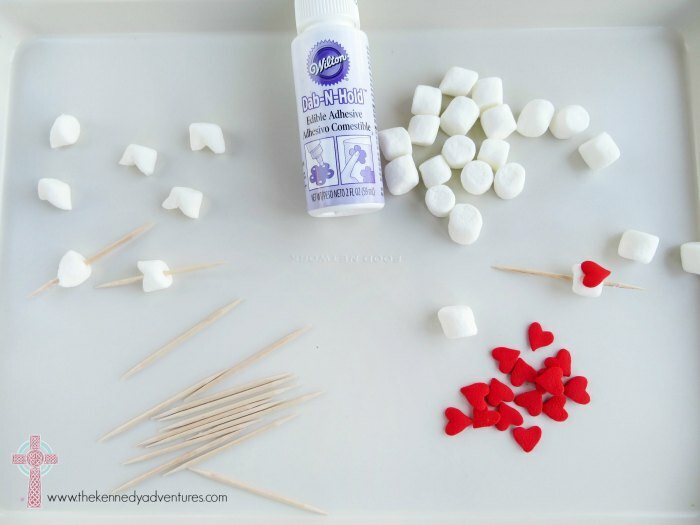 Using the edible adhesive, stick the confetti heart on top of the marshmallow. Stick this heart on another toothpick. Repeat until you have enough arrows for the hearts you'll be making. 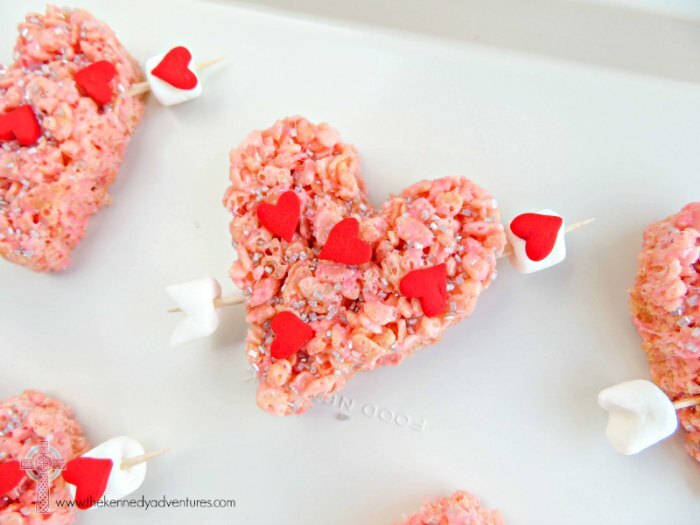 These treats are super cute and I’m sure my kids are going to love them. We are having some cousins over for a “crafternoon” and treats, I think this will be the one I make. Thank you for the inspiration and step by step. 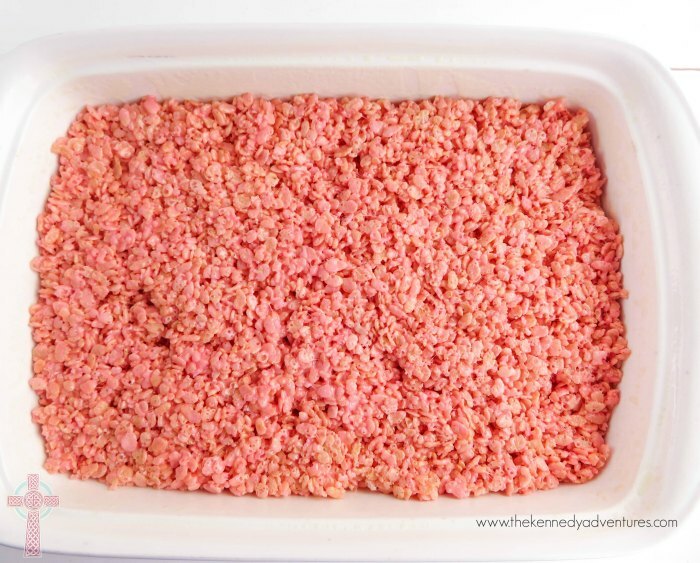 You would think that rice crispies are simple enough but believe it or not some of us have just been on the receiving end of the krispy treat. Can I ask the brand of the pot you have? Where you may have found it? I like the handles and that its deep.